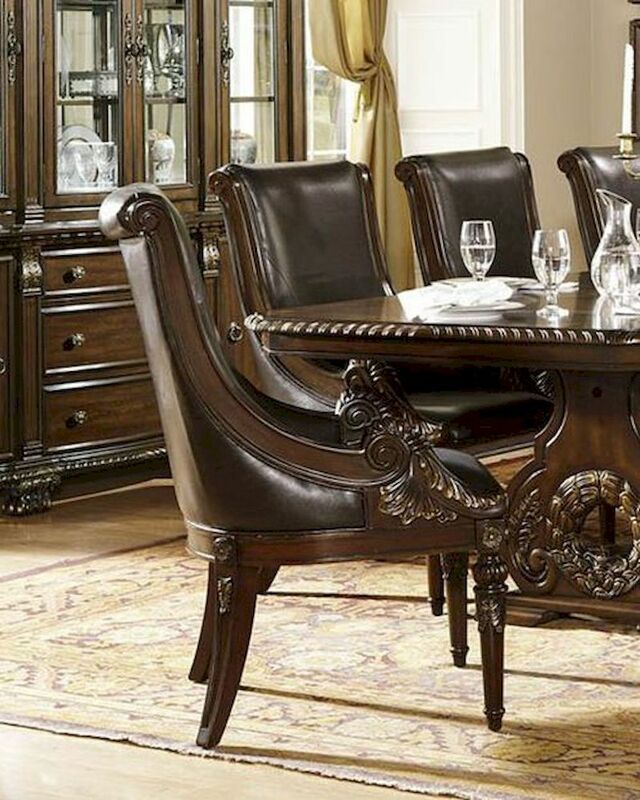 The grandeur of Old World Europe is flawlessly executed in the Orleans Collection. Acanthus leaf carvings feature prominently and blend with elegantly appointed moldings on each piece of this stately dining room offering. Wreath accents lend dramatic flair to the double pedestal table base as does the sculpted lion’s foot, supporting the server. The tabletop’s richly hued match cherry veneers feature decorative inlay, all surrounded by the elegantly carved rope twist edge. The accompanying server’s features include ample storage space, full extension glide drawers, with the center drawer opening to reveal protective felt serving piece storage. The heavily carved mirror frame provides an extra touch of elegance. The rich dark cherry finish with gold tipping completes the formal feel of the Orleans Collection.